The latest advancements in semiconductor technology have led to the development of light emitting diodes (LEDs) capable of emitting a narrow spectrum of UV radiation (UV LEDs) at wavelengths capable of inactivating pathogenic organisms. 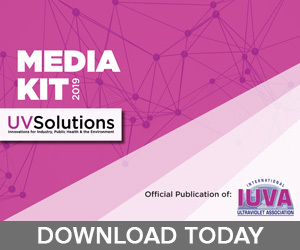 Recently, UV LED chips and packages, as the primary products, have been evolving in terms of power output, lifetime and even production cost management. Recent advances in UV LED technology have now made it possible to apply this technology to water treatment. In fact, UV LED possesses attractive features that can bring innovations to UV technologies for water treatment. Here, three important aspects of UV LED water treatment systems are discussed: design, operation and application. One of the most significant advantages of UV LEDs is the flexibility they offer in reactor design by providing a greater degree of freedom in reactor configuration and optimization. For example, several studies have applied various UV LED reactors for water disinfection (e.g., Würtele et al. 2011; Jenny et al. 2014; Oguma et al. 2016a, b), and each adopted a different reactor design concept. The design criteria for conventional mercury UV lamps do not necessarily apply to UV LED reactors because the UV LED is an entirely different radiation source, with a small footprint and an angular distribution of emission. Since cost is still one of the challenges for UV LED application for water treatment, design optimization to obtain high performance using a limited number of UV LEDs is essential to making the technology feasible. The performance of a UV reactor for water treatment is a function of the UV dose or fluence that is delivered to the water. Fluence, in turn, is a function of the fluence rate and residence time. As a result, the radiation and velocity distribution are determining factors for any UV reactor efficiency. These phenomena, along with the kinetics of microbial inactivation, the rate constant of which for any microorganism is a function of UV wavelength, will determine the overall reactor performance for water disinfection. The reactor radiation, hydrodynamics and UV wavelength can be better controlled in a UV LED reactor compared to a UV lamp reactor (Taghipour, 2018). 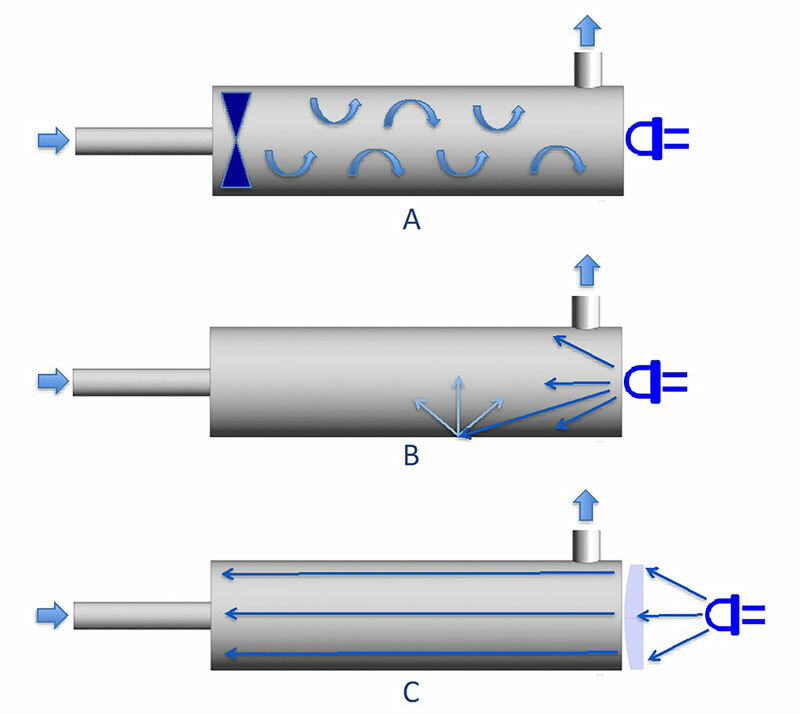 For small-scale reactors with applications in point-of-use (POU) and point-of-entry (POE), for example, the lamps are typically positioned at the central part of the reactor with their axis parallel to the main fluid flow direction. For such a reactor concept, there is a considerable non-uniform fluence rate distribution along the path of the different water streams flowing from the reactor inlet to the outlet. This is because the radiation distribution of UV lamps has a significant variance in the radial direction. In a UV LED reactor, this non-uniformity can be prevented, given that a UV LED radiation profile has a principal direction for which its angular view can be adjusted, and its radiation profile can be attuned. Further, the selection of the correct position and direction of radiant energy, which is easily possible for a UV LED reactor, can more effectively prevent the loss of radiant energy to the reactor wall compared to UV lamps. Similar limitations exist for controlling fluid flow velocity and residence time distribution in UV lamp reactors. Since UV lamps are typically placed inside the reactors, the hydrodynamics of the reactor is often largely influenced by the presence of UV lamps. For a small-scale reactor with a single lamp with its axis parallel to the main fluid flow direction, for example, the highest velocity is desired near the UV lamp surface, where the fluence rate is at its peak value. However, the velocity profile near the UV lamp sleeve, or any solid surface, in general, is virtually zero. Therefore, there are technical and practical limitations for matching flow and radiation distribution for achieving nearly ideal reactor performance for such a UV lamp reactor. This limitation does not exist for a UV LED reactor, where UV LEDs can be positioned in different places – including outside the reactor – and their radiation profile can be adjusted to result in higher fluence rates at higher velocity areas. The rate constant for the UV inactivation of different bacteria and viruses can vary with the wavelength, even at the vicinity of the DNA peak absorption (Mamane-Gravetz et al. 2005; Beck et al. 2015). Meanwhile, the peak wavelength of UV LEDs can be adjusted, aiming to achieve a higher inactivation rate constant for targeted microorganisms. This is the reason that the spectral sensitivity, or so-called action spectra, of microorganisms are of concern in UV LED applications. Thus, it would be of interest to summarize a dataset on fluence-response kinetics of various microorganisms under UV LED emissions. A few reviews have made such efforts based on the published data (e.g., Malayeri et al. 2016), which could serve as references. It is important to note, however, that simple comparison of inactivation efficiencies in different studies potentially can be misleading, given many inconsistent and incomparable data reported in the published studies, as discussed in one review article (Song et al. 2016). One main contributor to this inconsistency is using different experimental setups and various techniques for fluence measurement in UV LED inactivation studies (e.g., Würtele et al. 2011; Oguma et al. 2016a, b; Beck et al. 2017; Rattanakul and Oguma 2018). Therefore, standardization of a UV LED test protocol is necessary to achieve credible comparisons among different studies and, more importantly, to obtain correct inactivation kinetic data. Such protocol has been proposed (Kheyrandish et al. 2017, 2018), and an “IUVA test protocol” for a UV LED system is now under development by the IUVA task force. Figure 1. Design: A) hydrodynamics of UV LED reactors can be adjusted by applying a static mixer, where the radiation source does not interfere with the fluid flow; B) radiant power can be better preserved by using reflective reactor walls; C) radiation distribution can be controlled through optical lenses. For now, without such a standard protocol, a simple option for comparative studies is to summarize data obtained using the same setup and consistent fluence definition. This effort has been made by a research group, which presented the fluence-response profiles of various health-related microorganisms using UV LEDs at 265, 280 and 300 nm (Oguma et al. 2019). The group reports the inactivation rate constant and the fluence required for n log inactivation (n = 1, 2, 3 and 4) of pathogens (Legionella pneumophila, Pseudomonas aeruginosa, Vibrio parahaemolyticus, and feline calicivirus) and indicator/surrogate species (Escherichia coli, Bacillus subtilis spores and bacteriophages Qβ and MS2). Once a UV LED standard test protocol is available, researchers can conduct experiments in independent and comparable manners, and the results would improve and enrich the UV LED inactivation database of various emissions for diverse microorganisms. The special features of the UV LED reactor system include low voltages and power requirements, no warm-up time with the ability to turn on/off automatically and with high frequency, and different options for thermal management. These features could result in the operation of UV LED reactors for applications where UV lamp reactors cannot be used as efficiently. Some of the other special features of the UV LED water purifier include a robust design and small footprint, which make this technology appropriate for POU applications where traditional water treatment technologies may not be optimally used. Figure 2. 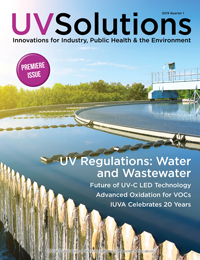 Operation: UV LED water treatment systems offer advantages, such as minimal maintenance cost, on and off capability, low power and voltage operation, and no mercury contamination. The UV LED reactors, in particular for POU applications, require low power and voltage, which means they can be easily operated with a solar panel with a chargeable battery kit, which is readily available on the market. Therefore, renewable energy at an affordable price may be used to turn UV LED reactor systems into an off-grid water treatment technology. Moreover, a lack of continuous electric power – in small and rural communities, in general, and particularly in developing countries – is often a problem, but would not be a significant limitation for UV LED. UV LEDs can be on when water is treated and off when it is not being treated. 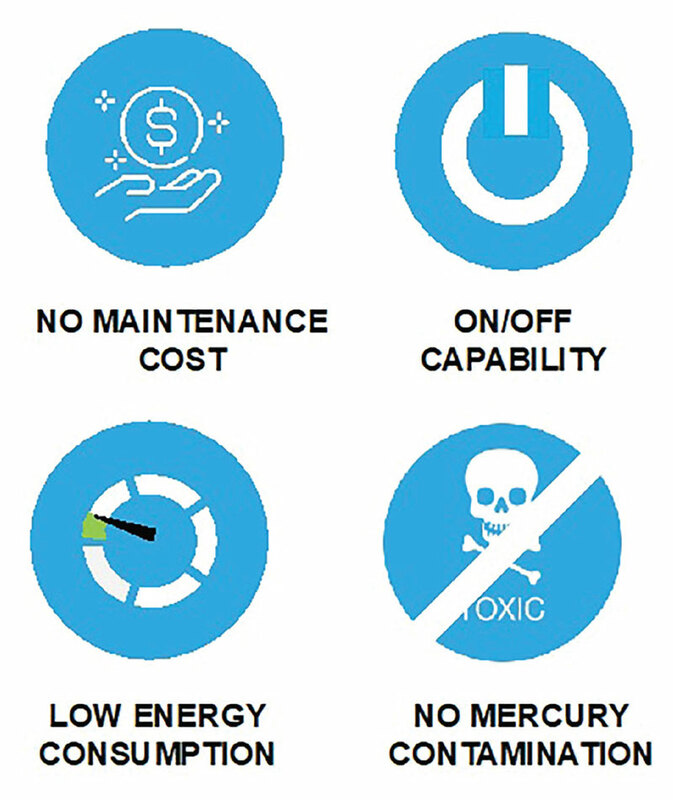 As a result, for POU applications where water is being used and treated intermittently, UV LEDs will likely not require replacement for the entire life of the device (resulting in lamp replacement cost savings) and consume only a fraction of the energy (resulting in considerable energy cost savings). More importantly, UV LED reactors require little maintenance. This includes frequent sleeve fouling cleaning and UV source replacement. 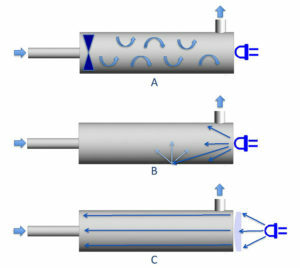 The fouling of UV lamp sleeves is mainly a result of lamps operating at relatively high temperatures and the lamp heat being transferred from the sleeve. The heat-induced precipitation of metals with inverted solubility is a leading mechanism by which foulant is deposited on the UV lamp sleeve. In UV LED reactors, the heat generated by the UV LEDs is removed from the LED circuit board (not the quartz window or sleeve), so sleeve fouling is not expected to be significant, which means that regular maintenance and cleaning is unlikely to be a major issue. 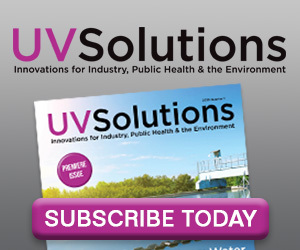 Therefore, the absence of skilled operators – which is one of the main limitations in small and rural communities – that hinders the application of many water disinfection technologies, may not be a major restriction for UV LED systems. Given the radiant power output and wall plug efficacy of UV LEDs at present, a more suitable application of UV LED reactors is the treatment of intermittent and low flow-rates. These include the integration of the reactor into a range of consumer and commercial appliances, such as water dispensers and coolers, ice and coffee makers, and laboratory and medical water equipment. Integration of a UV reactor into some of these devices has been made possible for the first time due to the UV LED reactor’s small footprint and special features. Another application is the treatment of water at the POU. POU water treatment is an emerging global industry due to the growing demand in both developed and developing countries; the market for such systems is expected to be worth nearly 25 billion USD in 2020 and is projected to grow at a compounded annual growth rate (CAGR) of about 10% (Point-of-Use Water Treatment Systems Market, 2016). Figure 3. Application: There are various possible applications for UV LED technology within the water sector, including UV water treatment systems for POU drinking water. Factors such as increasing water contamination, growing awareness of the importance of clean drinking water and increasing construction activities have driven the POU water treatment system market. UV LED reactors could be ideal for POU water treatment, given their obvious advantages, such as lack of frequent maintenance and reduced operational and lifetime costs, compared to UV lamp and other conventional technologies. Larger-scale UV LED reactors may be applied to the treatment of water at the POE for homes and cottages, particularly when the LEDs become a more feasible option. In the US alone, about 20 million households and cottages rely on private wells, while tens of thousands more rely on lakes, rivers and other surface water sources. Various studies have found that a considerable percentage of wells in any given region contain microorganisms, such as E. coli, that may be found in ground and surface water supplies at any given time. Thus, UV LED reactors represent one of the most effective water treatment alternatives to ensure safe drinking water for many recreational, remote and rural homes. In Japan, the population-based coverage of the public water supply is about 97.9% (as of 2016), which means the remaining population (about 2.7 million people) is relying on small-scale community water supply systems and/or private wells. Such small facilities are out of the chlorination mandatory, and sometimes there is no treatment, including chlorination. Face-to-face interviews with local residents have revealed that they do not really want to add chlorine because of taste and odor concerns, even though they understand the potential health risk of microbial contamination of the water. It is noteworthy that, in the drinking water quality accidents associated with health damage in the past 30 years in Japan, about 93% (130 of 140 accidents) were due to disinfection failure. In view of such facts, POU and POE devices that work for disinfection, ideally without negatively affecting taste and odor, would be the best and most practical options for community water supplies and private wells. It is obvious that UV LEDs can aid in meeting the water quality demands of these populations. Another important need for POU and POE treatments exists in developing countries, particularly those experiencing rapid urbanization and economic growth. The cost of UV LEDs can be an issue presently, but it will probably be a short-term problem. Dr. Kumiko Oguma, University of Tokyo, and her colleagues have done intensive field surveys on water quality and water use behaviors in Asia (i.e., Vietnam, Nepal, Indonesia, Sri Lanka and the Philippines) and noted that rapid urbanization generally results in limited access to centralized water supply systems. They encouraged many people to use decentralized water sources, such as private wells (e.g., Guragai et al. 2018, Do et al. 2014). Moreover, even if people have access to piped water supplies on their premises, it would not assure the access to safe water because piped water quality deteriorates after long transportation in a poor distribution network. In practice, local people use several coping strategies, including POU and POE installations. Survey results revealed that about 76% of the residents in central Hanoi were performing POU treatments at home (Do et al. 2014); however, some POU apparatuses in use were not functioning as an effective barrier against microorganisms. UV LED can be a smart add-in option for such systems. The UV energy cost for UV LEDs is currently higher than that of UV lamps. 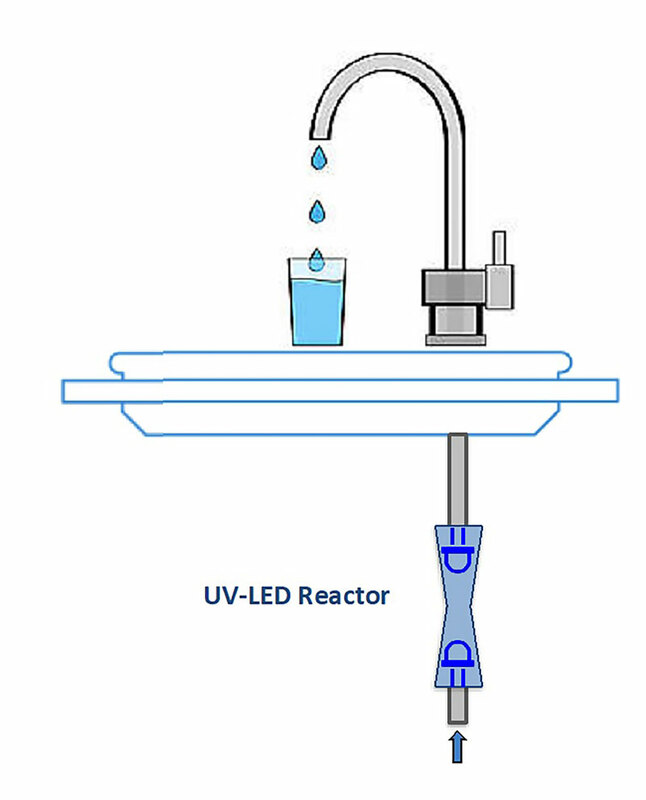 Once UV LEDs attain a higher efficiency and power output and become a more affordable option, there will be numerous possible applications for UV LED reactor technology for treating water on a larger scale, including drinking water and wastewater treatment plants. O.R., and Linden, K.G. (2017) Evaluating UV-C LED disinfection performance and investigating potential dual-wavelength synergy. Water Res. 109, 207–216. Beck, S.E., Wright, H.B., Hargy, T.M., Larason, T.C., and Linden, K.G. (2015). Action spectra for validation of pathogen disinfection in medium-pressure ultraviolet (UV) systems. Water Res. 70, 27–37. Do, A.T., Kuroda, K., Hayashi, T., Nga, T.T.V., Oguma, K. and Takizawa, S. (2014) Household Survey of Installation and Treatment Efficiency of Point-of-Use Water Treatment Systems in Hanoi, Vietnam. J. Water Supply: Research and Technology-AQUA 63(2) 154–161. Jenny, R.M., Simmons, O.D., Shatalov, M. and Ducoste, J.J. (2014) Modeling a continuous flow ultraviolet Light Emitting Diode reactor using computational fluid dynamics. Chem. Eng. Sci. 116, 524–535. Kheyrandish, A., Mohseni, M. and Taghipour, F. (2017) Development of a method for the characterization and operation of UV LED for water treatment. Water Res 122, 570–579. Kheyrandish, A., Mohseni, M. and Taghipour, F. (2018) Protocol for Determining Ultraviolet Light Emitting Diode (UV LED) Fluence for Microbial Inactivation Studies. Environ. Sci. Technol. 52, 7390–7398. Mamane-Gravetz H., Linden, K.G., Cabaj, A. and Sommer, R. (2005). Spectral Sensitivity of Bacillus subtilis Spores and MS2 Coliphage for Validation Testing of Ultraviolet Reactors for Water Disinfection. Environ. Sci. Technol. 39, 7845–7852. Oguma, K. (2018) UV LEDs for Water Treatment: Research Overview and Perspectives. IUVA News, Quarter 1, 20(1), 18–20. Oguma, K., Kita, R. and Takizawa, S. (2016b) Effects of Arrangement of UV Light-Emitting Diodes on the Inactivation Efficiency of Microorganisms in Water. Photochem. Photobiol. 92: 314–317. Oguma, K., Rattanakul, S. and Bolton, J.R. (2016a) Application of UV light-emitting diodes to adenovirus in water. J. Environ. Eng. ASCE, 142(3), 04015082. Oguma, K., Rattanakul, S. and Masaike, M. (2019) Inactivation of health-related microorganisms in water using UV light-emitting diodes. 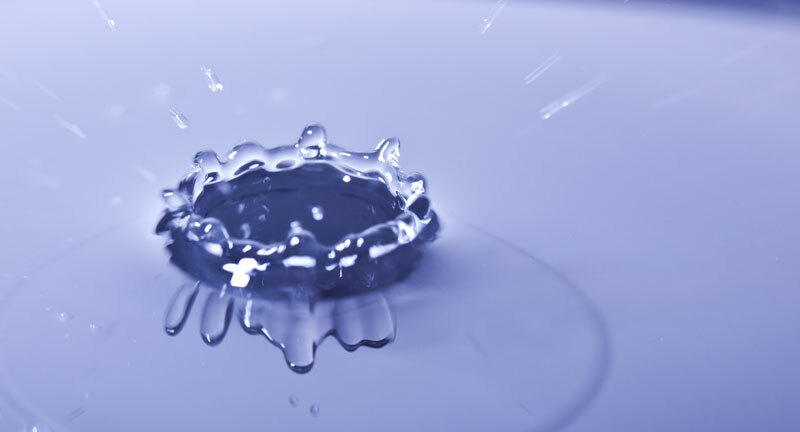 Water Science and Technology: Water Supply, in press. Rattanakul S. and Oguma, K. (2018) Inactivation kinetics and efficiencies of UV LEDs against Pseudomonas aeruginosa, Legionella pneumophila, and surrogate microorganisms. Water Res. 130, 31–37. Song, K., Mohseni, M. and Taghipour, F. (2016) Application of Ultraviolet Light-emitting Diodes (UV LEDs) for Water Disinfection: A Review, Wat. Res. 94, 341–349. Taghipour, F. (2018) UV LED Technology: The Times They Are A-changin’, IUVA News, 20(1), 14–17. Würtele, M. A., Kolbe, T., Lipsz, M., Kuelberg, A., Weyers, M., Kneissl, M. and Jekel, M. (2011) Application of GaN-based ultraviolet-C light emitting diodes – UV LEDs – for water disinfection. Water Res. 45, 1481–1489. Previous articleUV-C LED Systems: Land of Opportunity or Wild West?